EPISODE 12, SEASON 2- "WHO YOU REALLY ARE"
Well the cat is out of the bag now ladies and gents. Everybody knows Skye's secret at the end of this episode. 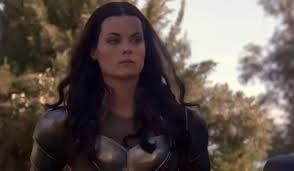 At the beginning, we see that Jaimie Alexander has reprised her role as Lady Sif, but she has lost part of her memory. A contact of Director Coulson alerts him of her whereabouts and S.H.I.E.L.D. tries to figure out why Sif is visiting Earth. It turns out that Sif is trying to locate a Kree. The Kree are an alien species that was discussed in the first half of season two, they also showed up on "Guardians of the Galaxy." They created the diviners to create an army and we find out that those experiments with the diviners went south. The Kree alien came to make sure no "weapons" were created from the diviners. While Coulson knows about Raina, Skye' powers begin to manifest almost immidately, which makes it tense. It suddenly turns from S.H.I.E.L.D. versus Kree and Asgard for the last part of the season. Coulson and his team choose to help Skye through her troubles, and help her train and master her newfound powers. It is a good episode and it did a good job of expanding the mythology around the diviners. The team locates a crate which is supposed to be filled with diviners and we learn that all of them are missing. We know one was used on Skye and Raina, we know the eyeless man who took Raina last episode is in possession of one. So where are the other four or five-ish diviners? Could HYDRA have them? Could Zarbo have them? Or an even greater evil? Are Agent Ward and Agent 33 on the trail for them, do they even know about them? There are several different roads that the hunt for the diviners could go and I think the show could go down some really exciting avenues. We learned some more vague whispers of what Bobbi Morse and Mack are up to. It seems pretty clear from this episode that Bobbi and Mack are NOT HYDRA, which I like. I don't need another season full of HYDRA double-agents after already watching one season full of HYDRA double-agents. The thing is, they are clearly trying to undermine Coulson and the rest of S.H.I.E.L.D. So my question is, who are they working for. Some people are guessing Leviathan, but the thing is Mack showed high emotionality when discussing how hurt he felt when his "friends ended up being HYRDA." Emotions don't seem they would hold on a double-agent for a terrorist group. Others are saying that Mack and Bobbi may work for S.W.O.R.D. a counter-terrorism organization that specialized in extraterristral threats, an organization that always butted heads with S.H.I.E.L.D. in the comics. It would make sense since we are being introduced to Kree and Inhumans slightly this season, I have a feeling an organization based on discovering the cosmos would be fitting. Plus, in a world where S.H.I.E.L.D. has been illegitimated, would a new organization be created in its stead? Lots of good stuff was brought up in this episode. I don't know what the outcome of Skye's powers will be. I am wondering what will come of Bobbi and Mack. Next week, it looks like Skye's father will be causing all sorts of havoc. I can't wait.